When I sat down at the computer and wrote this post eight years ago, I couldn’t imagine what an adventure I was starting with this little food blog. Since then I’ve retired after 30 years of teaching, met a lot of fellow food bloggers and become real-life friends with some of them, been inspired by the amazing women at BlogHer, been a speaker at a few food blogging conferences, remodeled my 100 year old house in Salt Lake City, got an amazing stove, built a raised-bed garden, and started a second blog focused on Slow Cooker from Scratch recipes. I’ve written 1,958 posts on Kalyn’s Kitchen in eight years (!) and I’m grateful I now have a fabulous web designer as well as my nephew/cooking assistant Jake, who helps me test recipes to make sure they work when you try them in your own kitchen! I also appreciate the ongoing design help from my brother Rand, who originally suggested I start a blog (and how can I ever thank him for that?) Rand has created all the headers and other graphics you’ve seen on the blog through the years. Eight years have brought a lot of changes, and this year I decided on another big change and bought a bigger house in the town where I grew up north of Salt Lake. As hard as it was to leave the house and garden I had lovingly refurbished and a neighborhood filled with nice people, from the time my father died in early 2011, I wanted a house big enough for my whole extended family to gather. I found a wonderful house that’s perfect for having family and friends over, and since I’ve been promising to share kitchen photos, that seems like a fun way to celebrate eight years of food blogging. But before I get to the photos, I want to give a big Thank You to my readers. Without readers and your encouragement and comments there would be no incentive to keep blogging, and I’m tremendously grateful for the support you’ve given my humble little blog. In last year’s anniversary post on Seven Things I Know About Food Blogging, I mentioned my goal of staying focused on things that are useful for readers, and I’m hoping I can continue doing that for many more years to come! And now, on to the new kitchen! The new house has a garden, but it’s nothing like the garden I left behind, and building a new garden space will be a project for next summer. In the meantime, I always wanted a warm window where I could grow herbs, so I’m loving this spot in the new kitchen. So far I have basil, rosemary, cilantro, mint, and parsley, and I’m hoping I can keep some of them going during the winter. I always wanted a rack to hang knives, but until now I never had a kitchen with a spot that would work. After I realized I had the perfect place for one in the new kitchen, I read the reviews and found this Magnetic Knife Bar at Amazon.com, with ultra strong magnets that keep my knives handy and out of the way. It’s the little things like this that make a kitchen easy to work in, and I love this knife rack! 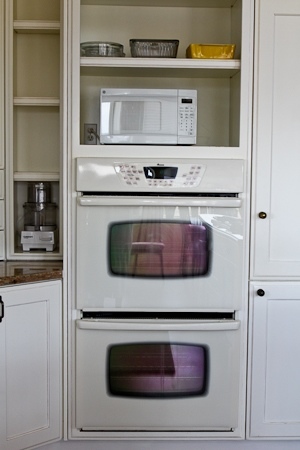 It’s ironic that the kitchen has a double oven, since I’m not really much of a baker. But I’m hatching a plan with some of my sisters to invite their grandkids to come here and decorate cookies at the kitchen island, so maybe having two ovens will come in handy. And I also need to figure out what to put in those narrow little shelves left of the ovens, but the food processor spot is pretty nice. And finally, I love it that there’s a deck right off the kitchen where I can keep my gas grill year round. In fact, after I had looked at this house several times, discovering the natural gas hook-up for a grill on that deck was the deciding factor that made me realize I was meant to live in this house! What Do You Love (or Hate) About Your Own Kitchen? I hope you enjoyed this little peek at my new kitchen, which may be the best blog birthday present I’ve ever gotten. And now I’d love to hear from you in the comments about the things you love (or hate) about your own kitchen! BTW, if you enter "new toaster oven" into the search bar I think you can see one of the ones I had. My second one was just a slightly updated version of that model. I actually had an oven (first one that didn't keep the temperature constant and then later one that took forever to heat up.) I mostly used the toaster oven because it was quicker and cheaper than heating up a huge oven for small amounts. I've had two Oster toaster ovens and loved them both, would highly recommend that brand! Congratulations on eight years and counting! I've been reading your blog on and off for years and one of the things that I found interesting was that I believe you did a lot of your early cooking just using a toaster oven? In so far as I am only cooking for one, I'd like to economize and try that as well. Do you have any recommendations on what I should look for in a toaster oven? Thank you for any advice! Carolyn, you MUST come and visit. And this time you can stay at my house. Well, Kalyn, congrats on the blog anniversary. We who blog all know that although it's fun to do, we also have to have dedication, which you have in spades. SO happy to see photos of your new kitchen – it looks wonderful. And the view – gorgeous. Hope to visit you there and see it in person! Idea for the shelves next to the stove? Small cookbooks? Maybe it's not deep enough – hard to see in the photos! Much happy settling in, Kalyn. Congratulations Kalyn for 8 great years of food blogging – i read a lot of food blogs and yours is one of the the most useful to me! I also have 2 ovens in my kitchen which is very useful to me as I bake all of our breads & pastries and we also make a lot of vegetables, chicken, fish etc in the oven. When we bought our current house the former owner also showed us that there is a gas hookup for a gas grill on the deck but this is going to be our fourth summer here and we still haven't bought a grill.. shame on us. Kalyn, I have been a quiet follower for years, but had to speak up to say congratulations on 8 years of blogging success. And also, congratulations on your beautiful new home and especially the kitchen! I absolutely love it! Can't wait to see what delicious things you cook up in there! I'm a little late to the party, but I wanted to extend a hearty congratulations, Kalyn! 8 years? What an achievement! I've loved getting to know you more via your blog and your recipes have saved me on the dinner-planning front on more than one occasion. Thank you for continuing to share your love of food and cooking with us! Susan, fun to hear we have the same standards in knife racks as well as so many other things! J-Mom, I remember well those WHB years! Alanna, didn't it go by so quickly! 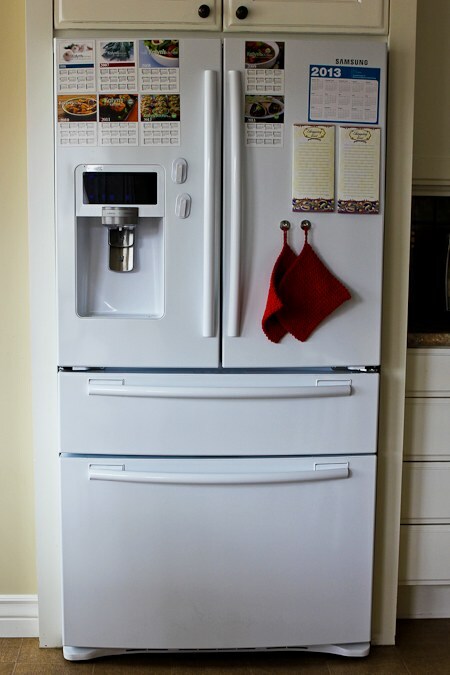 Love-love-love your new kitchen, Kalyn, I've been dying to see pictures! The view is spectacular and the island/stools, so easy to imagine lots of family hanging out in your kitchen, one big gathering place! Can't believe it's been eight years, either … onward! Happy Blogversary, Kalyn's Kitchen! And congratulations, Kalyn for maintaining consistently great blog posts for 8 years! I still remember the early days when you were so kind to link to one of my recipes and that's how I discovered yours. Then the Herb Blogging events that you hosted where I always found inspiration. I have been sporadic in my blogging and bloghopping the last few years, but thanks to facebook, I remain updated on your posts and still visit your blog every time one of them catches my attention. Your new slow-cooker blog also got me interested in using mine again. So, THANK YOU! You remain an inspiration to all food bloggers and food lovers. Congratulations again on 8 years and your beautiful new kitchen! P.S. I've been using that exact same knife bar for 20+ years and love it. Thanks Lawchick, Meeganjae, and mom. And putting cookbooks in those little nooks by the food processor is probably perfect for a "normal" person, but I have 3 full bookcases of cookbooks (they are in my office.) Still experimenting with those little spots! Happy Birthday to your wonderful blog. And congratulations on your new home and beautiful kitchen. How exciting! Love the new kitchen. Little nooks where you have your food processor, would make a lovely spot for recipe books. Happy blog-anniversary Kalyn! I am a relatively new reader (I was so happy to find your how to make perfect grilled chicken breasts recipe about a year ago!) I have become a way better cook thanks to you! I always learn from your posts, always written with great heart and great skill. (Also, a shout-out to Jake, your collaborator!) Congratulations on your new house and kitchen and view! Thanks Katie! It's been a long time hasn't it? Love you too Lindsey; so glad we are real-life friends now! Your new kitchen is beautiful! And so is the rest of the house. 🙂 So glad I have been able to connect with you over the years and that you've become one of my cherished friends–IRL and in Blogland. Love you, Kalyn! You're wonderful and Happy 8th Anniversary! And what a wonderful way to celebrate. Your new kitchen is gorgeous! What a joy it must be to cook there – esp. with that view. Thanks again to everyone for making my blog birthday so much fun! Congratulations! Your low carb recipes have been such a blessing; I use your recipes ALL THE TIME! I am so grateful for your blog. It is my go-to place for yummy vegetable recipes. As a low-carber, it is very important to me to find ways to add variety in the vegetable dishes. The fresh herbs in your recipes are wonderful! I also enjoyed your gardening posts. I'm going to try to grow those round zucchinis you always write about. Happy Bloggiversary!! I love your new kitchen- it is perfect for you. As for my kitchen I love my vintage green cabinets and pendant light over my sink. I have a love/hate relationship with the fact that I don't have a dishwasher. I try and stay positive and use the time as a peaceful pause in the day. You really are amazing, Kalyn! Eight years here and now over a year with your new blog, and you're never disappointed us! Big, big congrats to you, dear! I LOVE your new house. After seeing that view and reading in comments that it will always stay that way, I totally see why you couldn't resist this house. I'm so happy for you! Lovely morning read with my first cuppa, Kalyn. And congrats to you on your new home and beautiful kitchen. The view and light from those windows is amazing! I think I'd have a whole different reason to be off task every day standing in front of them, or being on that patio. Loved remembering the remodel work at your old house, and smiled over the photos of all the conference shots. Fun! Here's to another milestone. Sending hugs. I am so touched by all the nice comments, and it's fun to hear from so many readers and fellow bloggers I've "met" through the years. And I do feel blessed to have such a great kitchen!